Flights from Hawaii to Australia all leave from Honolulu, so the first step was flying from Maui to Oahu. This time we flew Island Air, which meant our plane had TWO propellers instead of one–a tiny blessing. 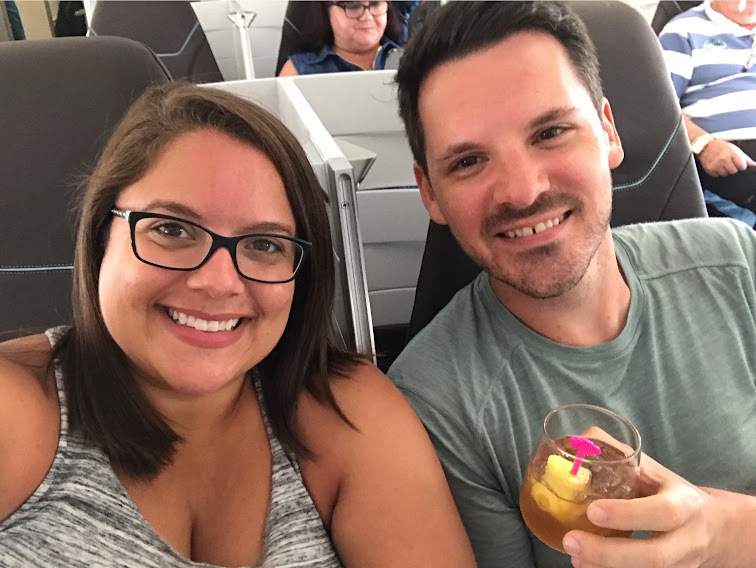 Our flight was uneventful, and we made our way to Hawaiian Airlines’ new lounge in the Honolulu airport: The Plumeria Lounge (we had access because of our business class seats). After being spoiled at so many swank international airport lounges, we found this one a bit lacking (the ultimate #firstworldproblem). It was comfortable enough and they had some snacks as well as Wifi, so good enough for our purposes, but nothing stellar. Our Hawaiian Air flight from Honolulu to Sydney, on the other hand, was very rave-worthy. We’re totally spoiled people and decided to fly business from Hawaii to Sydney because of the length of the flight (10+ hours) — once you get past 5-6 hours in a plane, sitting in a tiny seat that isn’t even wide enough to fit your actual body becomes unbearable. It also helped that we booked the flights a while ago and they were available for a (vaguely) reasonable price. If you have a chance to fly business on Hawaiian Airlines, give it a try. Here’s why: 1) the flight attendants were lovely, 2) they serve delicious Mai Tais right when you’re seated and have them available throughout the flight, 3) the seats are spacious and comfortable and lie flat for a comfortable nap, 4) the amenity kits are quite nice, and 5) the bathroom is actually bigger than any other airplane bathroom I’ve ever been in! (You’ll notice throughout my posts that I care about bathrooms…a lot.) If I had to find a complaint, it would be that their entertainment selection is a bit limited (they give you an iPad to use for the flight)–but that may also be due to the fact that I’ve been flying way too much lately and I’m running out of movies to watch (even more #firstworldproblems). We landed at the Sydney airport in the evening and of course I was starved. Fortunately, the international terminal has a McDonald’s and so I had to get some Mickey D’s for my first “Australian” meal 😂 Pretty delicious stuff! (Those who have followed me on social media in the past will know that trying McDonald’s in every non-US country is my favorite thing to do. This tradition will continue.) We had a quick overnight layover before our flight to Cairns, so we had a hotel room reserved at Rydges Sydney Airport Hotel, which is literally right across from the international terminal. For anyone looking for a room near the airport due to a layover or early flight, I fully recommend it–it’s incredibly convenient and the breakfast the next morning was delicious. Who would have guessed?! Day 16: Back to the tropics we go! We picked up our rental car (after waiting yet again in the longest line ever) and drove (on the wrong side of the road!!!) to our Airbnb for check-in. We were back in a private room/shared apartment situation, much to my dismay. After a very early morning breakfast, I was starved by now and so we went for a quick lunch at The Pier Bar. I had a craving for Mexican food so I got the tacos…and then I remembered that I was no longer in the land of authentic Mexican food. They weren’t terrible, but they weren’t delicious either–so sad. My first Australian beer (James Squire One Fifty Lashes) was far more yummy. We went grocery shopping afterwards (notice a trend yet? )–I am happy to report that groceries in Cairns were much more reasonably priced than those in Hawaii–and then stayed in for the night to get ourselves acclimated. A little Googling told us that the weather would be iffy, so we decided to skip the beach and visit Kuranda–The Village in the Rainforest–instead, and I’m so glad we did. After a quick and delicious lunch at Frogs Restaurant in the center of town (with some lizard friends nearby), we spent the day at Rainforestation Nature Park, which I fully recommend. They have a wildlife park where you can interact with kangaroos and wallabies, offer an opportunity to learn more about the Pamagirri aboriginals, and have an army duck rainforest tour. Wildlife Park: I’ve decided that, despite being a cat person vs. a dog person, I would totally get a dingo if I could. Also, kangaroos and wallabies are adorable but they poop a lot. Koalas are super cute but so lazy. Crocs are terrifying. In summary, everything was precious, except for the crocs. Army Duck Rainforest Tour: This wasn’t quite as exciting as I had hoped it would be, but our guide was great, which makes all the difference. He talked us through a lot of the different trees and plants in the rainforest, including what we should stay away from–always a valuable lesson! We stopped by Trinity Beach on the way home for an oceanfront drink at Trinity Beach Tavern, a lovely way to wind down the day. Yet another night in after that…vacationing has made us old and sleepy. As noted in my packing post, I knew that we would be exposed to more germs than ever on this trip and thus catching the plague was inevitable, but I was not prepared for it to come so early in our trip. I woke up fine that day, but within a couple of hours I was huddled under the blankets shivering and sweating incessantly. I didn’t want to admit it was a fever but Ben felt totally normal and I couldn’t deny the shivering and aches & pains for long. Thus, today is dubbed ‘the day Sally died and Ben went for a walk’–because what else was poor Ben supposed to do while I shivered and dozed in and out? [Note: I did find a way to muster the energy to make it through one episode of Game of Thrones–nothing gets between me and Khaleesi.] I was also pretty distraught because we had pre-booked tickets for a Great Barrier Reef (GBR) tour the next day and I knew I wouldn’t survive a boat ride in my state. Enter: my drug supply! I took my entire supply of DayQuil over the next 12 hours (don’t worry, I took appropriate dosages at the right timing!) and was able to stop shivering long enough to take a shower that night–something that seemed impossible earlier in the day. I went to bed praying for a little mercy from the plague gods. By the grace of god, I woke up without a fever! It must have been a 24 hour bug rather than the flu…thank goodness! The trip to the GBR was on. Of course we get outside and find that our rental car has been broken into at some point since we had last driven it. All of the compartments were left open and out of place, but fortunately we hadn’t left anything in the car to steal. I had a suspicion that they stole the floor mats (I kid you not) because they weren’t there, but I wasn’t 100% sure they were there when we picked up the rental…so we decided to move on with our lives. Nothing gets in the way of our fun! Though not our first choice (we were initially looking at a smaller sailboat), we booked our tour with Tusa, and we would recommend them to anyone interested in booking a snorkeling or diving tour of the GBR. They were very organized, served a yummy lunch, and had good guides onboard who knew a lot about the GBR and what we could expect to see. We stopped at two reefs for snorkeling: Hastings Reef and Michaelmas Cay. The video below is a compilation of Ben’s GoPro adventures at both snorkel spots–can you spot the turtle, giant clam, and Nemo?! As mentioned previously, I’m not exactly a huge fan of snorkeling (because of my very rational fear of the ocean) but the GBR was totally worth the initial mini panic attack. There were so many beautiful fish and the coral was really amazing as well. My favorite parts? The super cute turtle, all the Nemos, and the small blacktip reef shark (!!!). Yes, Sally, the person scared of the ocean and absolutely terrified of sharks, saw a shark. Thankfully I was with a guide when it happened, and he swam away so fast that I didn’t have time to panic. Of course Ben had the GoPro so I didn’t capture it on film, but I promise it was real–I swam with a shark in Australia! So badass. We decided to treat ourselves with a dinner out on the town (because really, who has the energy to cook after an entire day on a boat? ), and I had a hankering for a juicy burger after all the swimming. 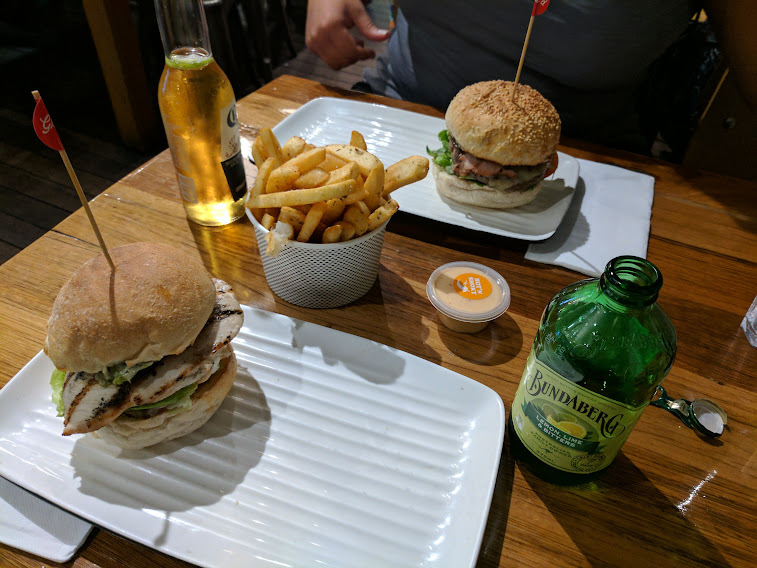 We went to Grill’d, which is (apparently) a burger chain and had great reviews. Ben enjoyed his chicken sandwich but I have to say that my burger was a bit subpar…I don’t think it was actually bad, I think I’m just a burger snob. It looks like no one does burgers like the Americans! That said, those fries (ahem, excuse me, CHIPS) were delicious–I’d eat those all day, any day, especially with that chipotle mayo-type dip. Day 20: Why is everything in Australia a deadly experience? 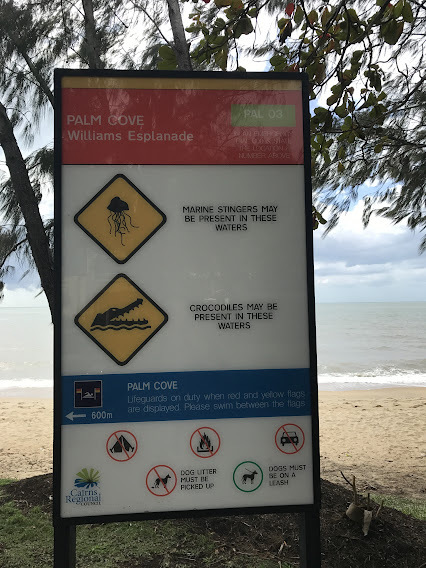 Apparently, even going to the beach is a hazardous experience in Australia. I stayed far away from the ocean and just absorbed my vitamin D supply for the day instead, because I refuse to die before I make it to Bora Bora. The rest of the day was pretty dull, so I’ll stop there. Up next? How we survived the Australian Outback. Thanks for reading!